It’s not quite known where David West is going next season, but it’s not going to be another year with the Indiana Pacers and certainly not joining the New York Knicks, a team anyone with an ambition of winning anything anytime soon is staying away from. So why not the Knicks? Simple. West opted out of his $12.5 million deal with the Pacers despite knowing he’s not going to get that kind of money somewhere else. Reports linked him to the Knicks, or at least New York’s interest in him. But the veteran power forward opted out of his deal with the Pacers not for money, but because he wants to be part of a title run. The Knicks can’t offer him that. And that takes us to Indiana, where West has played since 2011. 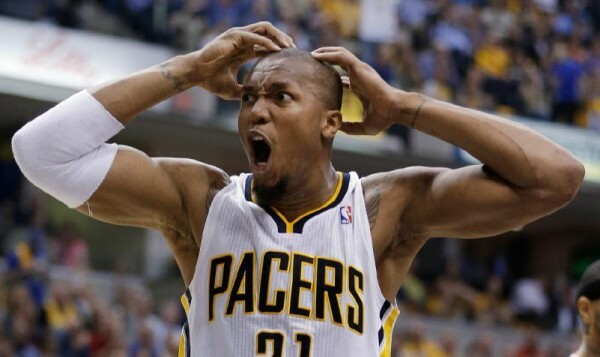 The Pacers entered the 2014 offseason with two conference finals in a row behind them. This was a team built to win now. But then things fell apart. Lance Stephenson felt insulted by the Pacers’ offer ($44 million, five years) and for being told to stop acting like an idiot on the court by both his coach, Frank Vogel, and Larry Bird, who is something of an authority figure. And Paul George. George, the rising star of the team, beginning a recently signed max contract, was out for the season after breaking his leg in an exhibition match with Team USA in preparation for the Basketball World Championship. He made it back in time to see the Pacers miss the playoffs, but you can write one big ‘missed season’ on last year for the Pacers. And West? At almost 35, after making over $87 million in salary during his NBA career, he’s after opportunities to play for a title. He didn’t see the Pacers doing that, but that wasn’t just it. He felt disdain for Larry Bird and the organization at the end of the season, specifically for what he feels was serious mistreatment of Roy Hibbert. That’s one thing where I wish they would have handled better was the situation with Roy. I’ll be honest with you, that bothered me a little bit, and I told Roy that. I’m the type of guy who feels like we’re all in this fight together and I’m not designed in that way to put it all on one guy. That did rub me the wrong way. That threw me off. I started reading some of that stuff, I started thinking, ‘Whoaa.’ I just didn’t feel good about that. I told Roy that it bothered me, that he’s still my teammate. Hibbert, despite his defensive abilities, seems to have fallen out of favor with Vogel and Bird since the 2014 playoffs. Reports suggest they tried to force him to opt out and give up $15.5 million he wasn’t going to make anywhere else (he opted in) and then pretty much let it known in the media that there’s a good chance he’ll be benched if he doesn’t adapt to the offensive changes. West is probably waiting to see how teams maneuver the beginning of free agency and position themselves towards winning an NBA title, and then make his decision.